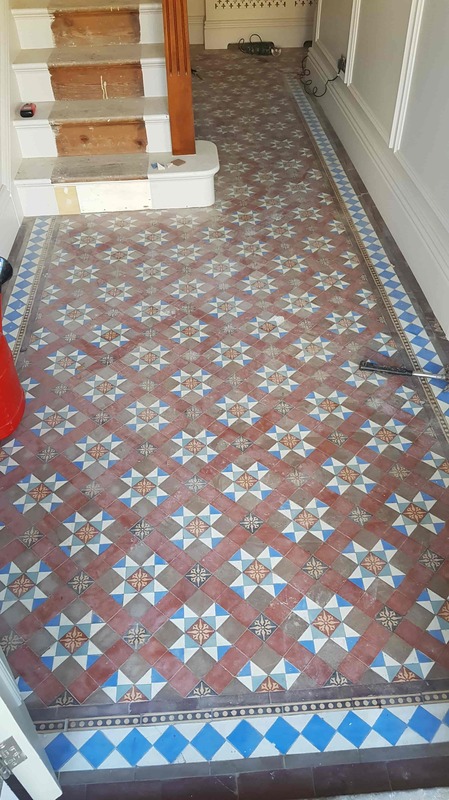 This beautiful Victorian tiled hallway was in desperate need of some TLC. The house had recently changed hands and the new owners of the house were having the entire property renovated. 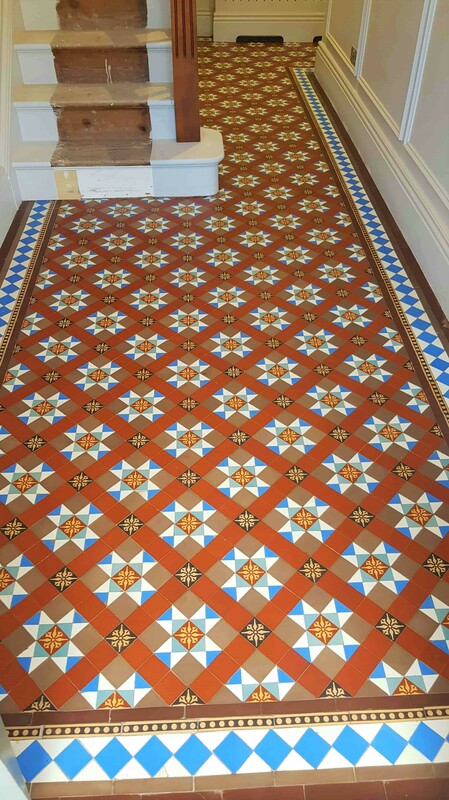 The last part of the renovation plan was to have the Victorian hallway tiles restoring back to their former glory. Floors are always best left until last, especially hallways as last as workmen don’t usually take a lot of care in my experience. The house was built in the early 1900’s and was situated close to Doncaster town centre a couple of streets away in fact from the famous Doncaster Racecourse which dates to the late 1500’s. There were a few areas of damage to the floor that would need dealing with first. This is not surprising given the age of the floor which must have seen a lot of comings and goings over the years. 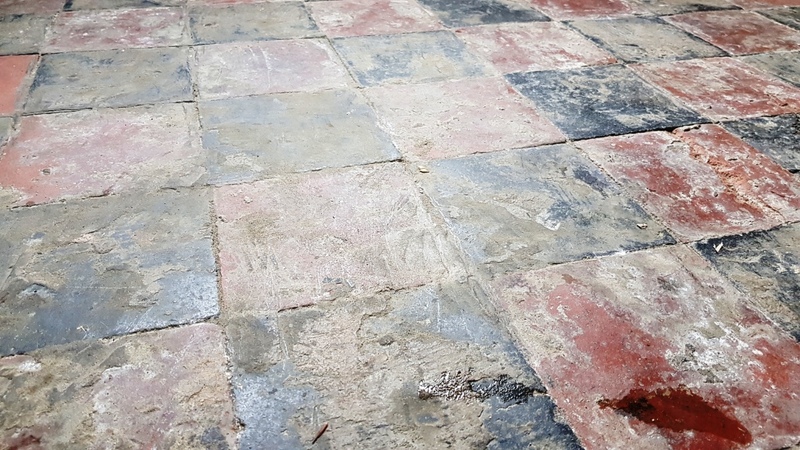 Our first task therefore was to repair the damage using replica tiles sourced to be as close a match to the originals as possible. We usually find any slight differences disappear once the floor has been deep cleaned and sealed. Once removing the damaged tile and cleaning the base we use a fast setting adhesive to fix the replacement tiles in place so we can get on with the cleaning as soon as possible. Once the replacement tiles had set, we unloaded our slow speed rotary floor machine and large wet vacuum which would be used during the cleaning. To start the cleaning the floor was sprayed with Tile Doctor Remove & Go and this was left to dwell on the tiles for twenty minutes. 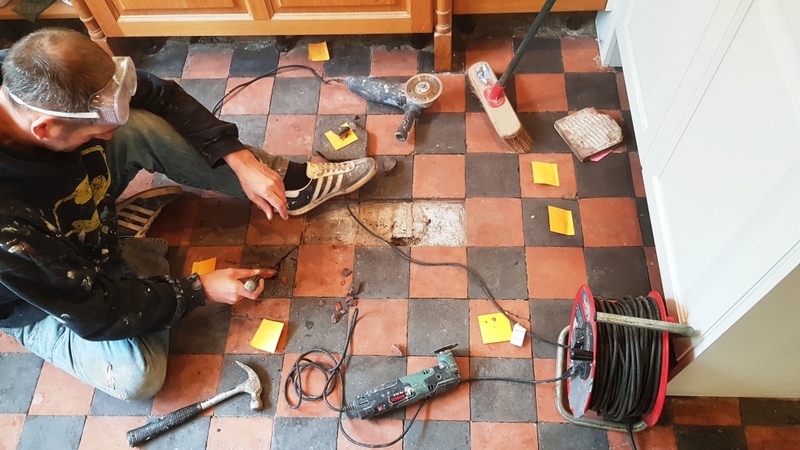 This gives time for the product to break down old floor coatings and grime, this was followed by scrubbing the tiles with a 200-grit diamond pad fitted to the floor machine and assisted with the addition of more water to help lubricate the process. This process generates a lot of slurry as the dirt and old sealers etc are released from the tiles and this is extracted from the surface of the floor using the wet vacuum. The next step was to give the floor an acid wash using Tile Doctor Acid Gel which is applied to the tiles and left to dwell for fifteen minutes and scrubbed in again with the floor buffer and 200-grit diamond pad. Once done the floor was rinsed with water and then dried using the wet vacuum to extract as much moisture as possible. This last process is designed to counter any alkaline salts that may be present in the floor which may cause efflorescence to appear later. It also removes old mineral deposits and generally get the tiles looking much brighter. Once complete the floor was left to dry off naturally overnight. I came back the next day to seal the tiles first checking the floor was dry using a moisture meter. Satisfied that the floor was ready for sealing I started to seal the tiles using multiple coats of Tile Doctor Seal and Go Extra which is a fully breathable sealer which is important for old floors like this. Seal and Go Extra also leaves a lovely satin finish which works well on Victorian tiles and brings the floor alive. 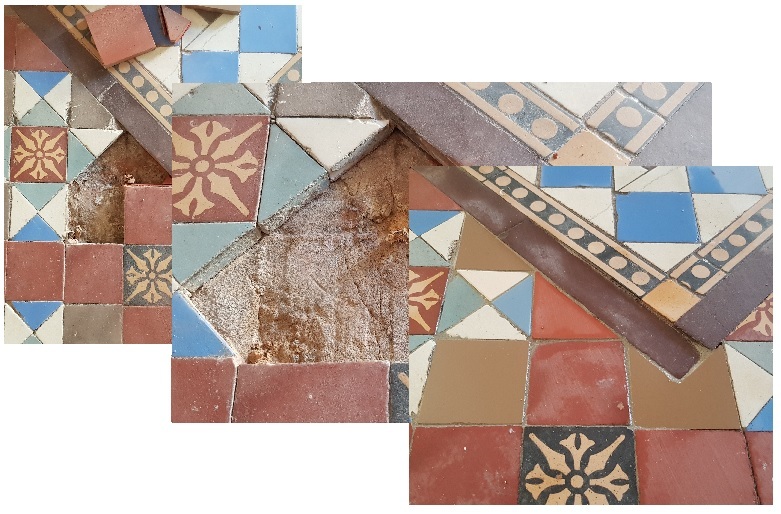 This was the last step in this properties renovation, and I think you will agree that the floor responded really well to the restoration process and the colours in the tiles are now very vibrant. We were called to this beautiful Victorian house in Nether Edge, Sheffield. The house sits on a tree lined street full of big Victorian homes and dates back to 1898. The current owners were keen to preserve the properties old charm and character and had made quite a few improvements sympathetic to the age of the property. 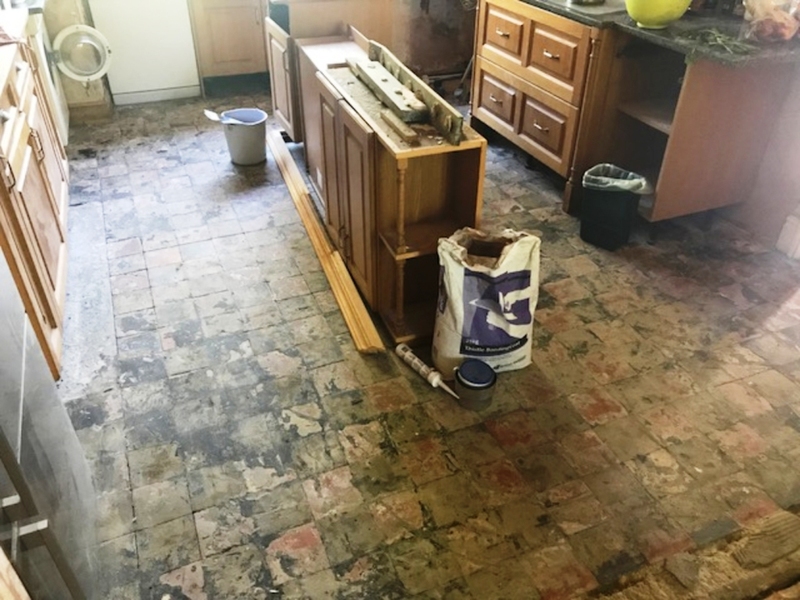 They had begun by removing some tasteless ceramic tiles that had been installed sometime in the 1990’s and were shocked when the original quarry tiled floor was uncovered buried beneath two layers of tile adhesive and a layer of bitumen! They gave us a call and asked us to come and have a look and see if we could restore the floor. I went to the property and as they had described the floor was in need of some help. After several test cleans we came to the conclusion that all the damage was repairable, and the floor was able to be rescued. I offered them a quote to complete this restoration work which they gladly accepted. Due to the nature of the work involved the job would take four days to complete. 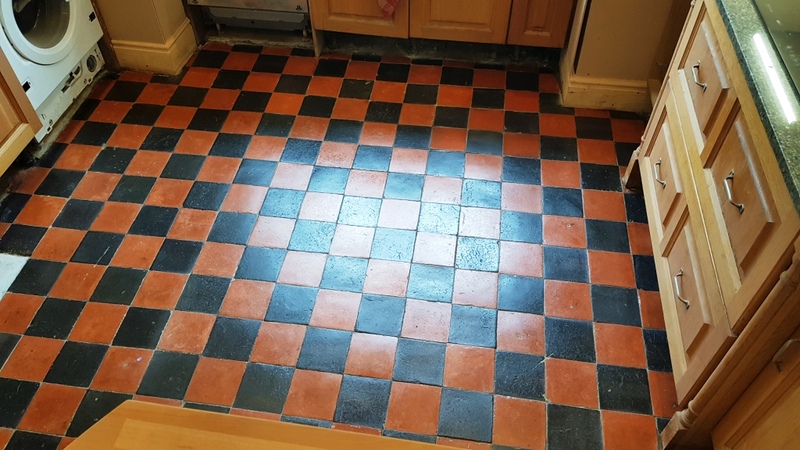 The client was also having their kitchen re fitted, so we discussed that we could use some of the original tiles that were going to be covered by a new island by lifting them up and storing them until we needed them to patch the holes up and replace the cracked tiles. The owners also managed to source some reclaimed tiles which were also a perfect match. 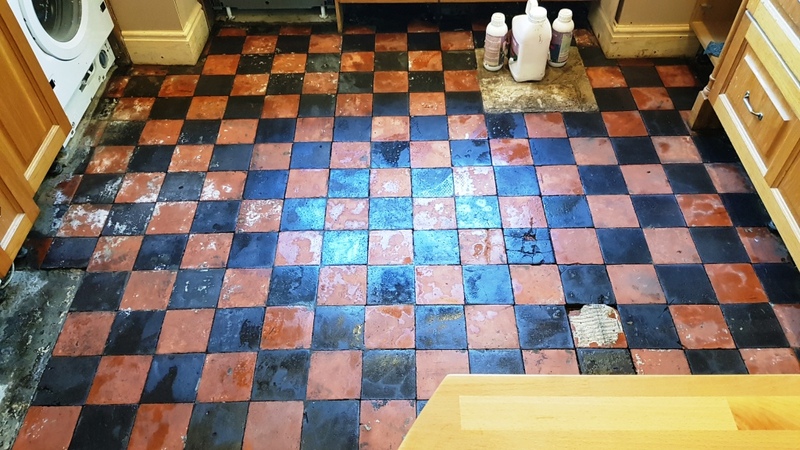 We began by removing the old adhesives and bitumen with a combination of Tile Doctor Grout Clean-up with Pro-Clean and assisted with steam, a heat gun and good old-fashioned elbow grease. It was painstaking work but after 2 days we had uncovered the floor. There were areas of damage, areas with no tiles, patches of loose tiles and areas where tiles had never been, like the two doorways which weren’t original, so tiles were never placed there. 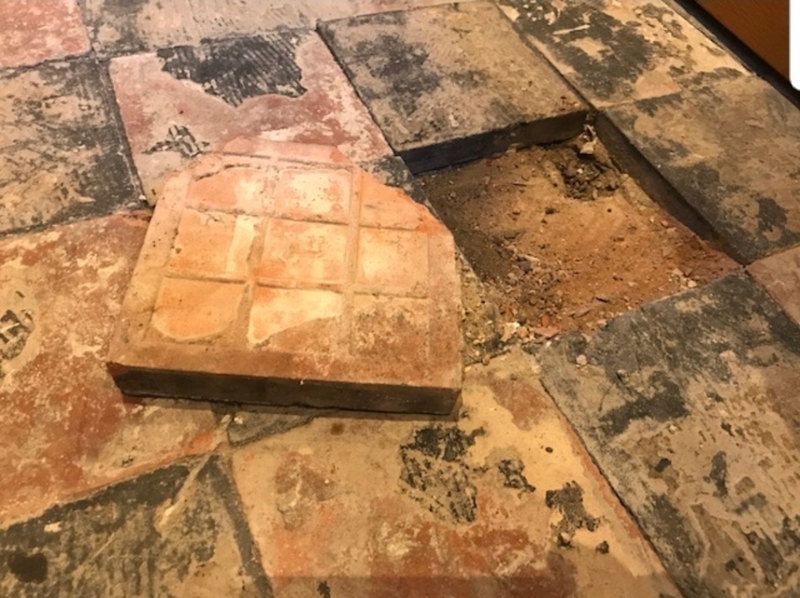 We used the rescued tiles and the reclaimed tiles to repair these areas, once the tiles were in you wouldn’t have known any damage had existed. There were many areas of missing grout, so we installed new grout and gave the floor one last wash. As you can see from all the pictures there was a lot to do. 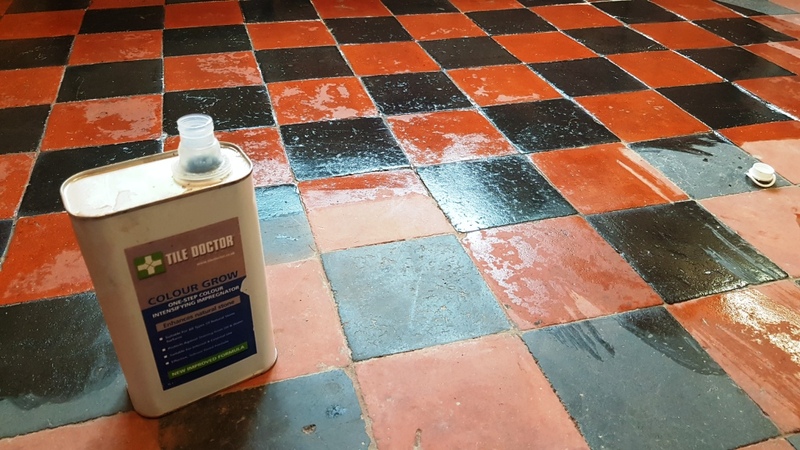 Once the floor had dried completely we returned to seal the floor, we applied one coat of Tile Doctor Colour Grow, a colour enhancing impregnating sealer which we left to soak in and cure. Then we applied 5 coats of a satin breathable sealer Tile Doctor Seal & Go Extra leaving the floor with a beautiful natural finish. It was a long job that took four days to completed but the transformation we achieved was well worth the effort. Our clients certainly thought so and were over the moon that an original and unknown part of their house was now restored back to its’ former glory and will hopefully last another 120 years. They even left the following comment on the Tile Doctor feedback system.